Vitiligo is a skin condition in which the skin loses melanocytes, the cells that produce melanin, the pigment responsible for skin, hair and eye colour. As a result, irregularly shaped, smooth white patches appear on different parts of the body, sometimes including the inside of the mouth and nose and the retina of the eye. Hair growing on affected areas may also become white because the melanocytes are sometimes lost from the follicles. 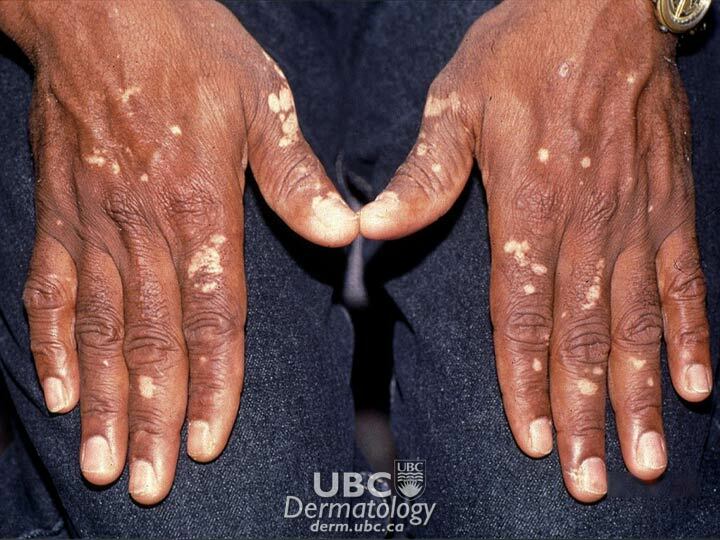 In some people with vitiligo, only one or two patches may be present; in others, patches can appear over a large part of the body. It is most noticeable in people with dark skin. There is no way of telling how much pigment loss will occur in any one person. Usually, the disorder is progressive, meaning that over time the white patches will spread to other areas of the body. Spreading can occur slowly or rapidly. Vitiligo is neither dangerous nor contagious. The condition seems to run in families and occurs more often among people who have certain autoimmune diseases, such as hyper- or hypo-thyroidism (an over- or under-active thyroid gland), adrenocortical insufficiency (underproduction of the corticosteroid hormone by the adrenal gland), rheumatoid arthritis, type 1 diabetes, psoriasis, systemic lupus erythematosus, and pernicious anemia (subnormal red blood cell level caused by an inability to absorb vitamin B12). This suggests that these different autoimmune diseases probably share at least some predisposing genetic or environmental causal factors, although these mostly remain unknown. 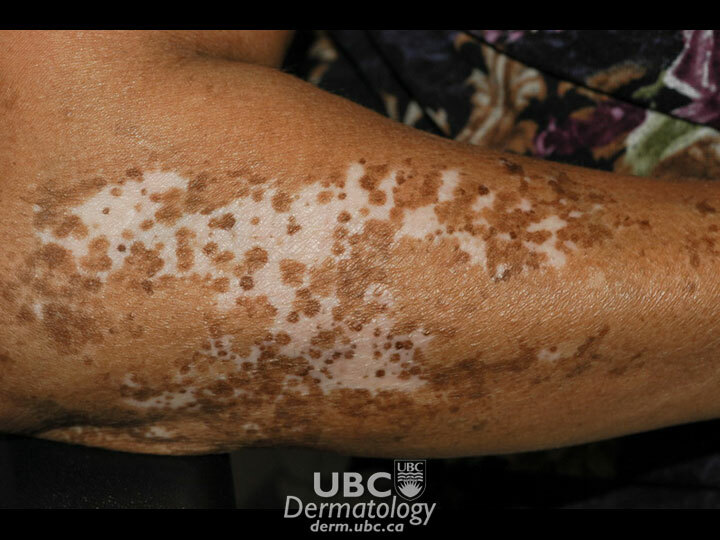 Many scientists believe that vitiligo is an autoimmune disease where the body’s immune system destroys or disables the melanocytes due to proteins called cytokines. The exact mechanism is not well understood at this point, but may be related to multiple genes plus exposure to environmental risk factors or triggers. Phenols and stress, whether emotional or physical, are suspected to be environmental triggers, but research continues into these and other possibilities. About 0.5 to 1 per cent of the general population has vitiligo. The disorder affects both sexes and all races, but is more noticeable in people with darker skin. Vitiligo can start at any age, but about half of those with vitiligo develop it before the age of 20, and about 95 per cent before age 40. 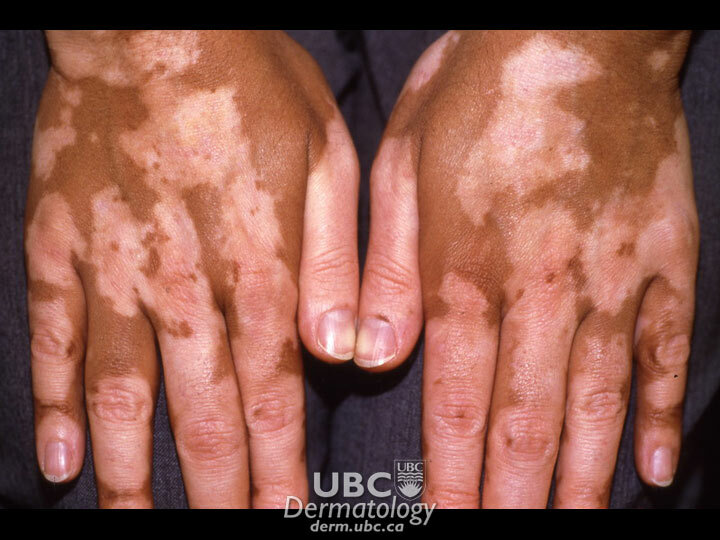 Approximately 20 per cent of vitiligo patients have a family member with the same condition.